A few brands have come out of Father's day gifts. Clarins is one of them, and offers a complimentary travel-sized NEW Exfoliating Cleanser 2-in-1 when you purchase a ClarinsMen Moisture Gel, 50ml ($68). While supplies last. Givenchy at Metro offers the Play Intense Coff Trouss EDT set for $120, including 100ml EDT + 50ml AOS* + pouch. 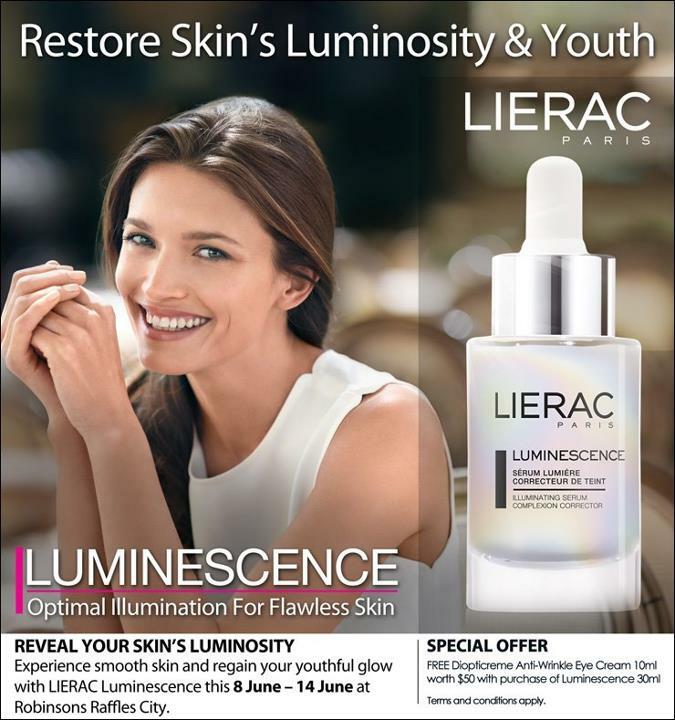 Lierac at Robinsons Raffles City offers a 10ml Diopticreme Anti-Wrinkle Eye Cream free (a $50 value) with purchase of Luminescene 30ml. Till 14th June. Aveda offers free overnight shipping, travel size Light Elements Smoothing Fluid and men's aftershave sample with any $40 purchase. Enter code DAD62 at checkout. Valid thru Jun 12. Beauty Encounter offers 10% off on Sun Care products. Enter code SUN985 at checkout. Valid thru Aug 31. Bergdorf Goodman is having their Be Beautiful beauty event. Receive an exclusive cosmetics bag filled with must-haves of the season with any $200 purchase. Plus get GWPs from over 60 brands as well. From today till Jun 24. Bloomingdales is having their Private Sale Preview starting today. No discount on beautys but there are a lot of GWP offers and double loyallist points. 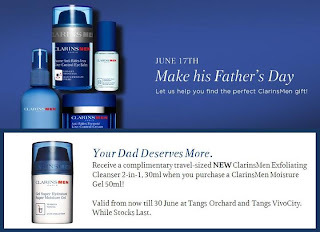 Clarins offers free 5-pc gift set with any $35 purchase. Enter code JUNEGIFT at checkout. Valid thru Jun 12, can stack with the free shipping code below. Clarins offers free express shipping with any $50 purchase. Enter code DAD at checkout. Valid for Jun 11 only. Clinique offers free shipping and 3 travel size minis of your choice with any purchase. No code needed. Choose your minis at checkout. Valid thru Jun 12. Cosmedix offers free Clarity Serum 7ml with any purchase. Enter code CLARITYJUNE at checkout. Valid thru Jun 17. Dermstore offers free Atopalm Moisturizing Cleansing Wipes with any $75 purchase. No code needed. While supplies last. Dermstore offers 15% off all Avene Sun Care products. No code needed. Valid thru Jun 17. Elizabeth Arden Summer Purchase with Purchase is available now. The PWP is priced at $26.5 with any purchase and valued over $110. Check details below. Everyday Minerals offers deluxe samples of Jane Eyre Eye Shadow and Weeping Willow Eyeliner with any $21 purchase. No code needed. While supplies last. Fresh offers free 2nd day shipping with any $100 purchase. Enter code DAD2 at checkout. Valid thru Jun 12 noon EST. Hautelook is having Freeze 24-7 and Belegenza sale events today and tomorrow. Jack Black offers free Supreme Cream Triple Cushion Shave lather 90ml (a $12.50 value) with any $50 purchase. Enter code SHOPFORPOPS at checkout. Valid thru Jun 15. Lovely Skin offers free travel size Obagi Cleansing Gel with any $75 purchase. Enter code LSFD12 at checkout. Valid while supplies last. Macy's is having a Men's Fragrance Event. Make any $65 purchase and you will receive a free Soccer Ball. Plus many other fabulous GWPs from 40+ brands. Including a 7-pc Estee Lauder summer gift with $35 purchase, a 7-pc Clinique Summer Purchase with Purchase at $36.50, and many more. Click to check more details. MyChelle offers free 60ml Apple Brightening Mist (a $17 value) with any $50 purchase. No code needed. Valid thru Jun 13. Pur Minerals offers a gift of your choice from $10 steals when you make any $25 or more purchase. Most of the $10 Steals items are valued $20+. Add the $10 steal item to your cart and enter code CHOOSEGIFT at checkout. Valid thru Jun 17. Sally Beauty offers 10% off on Equipments. Enter code 555108 at checkout. Valid thru Jun 15. Sephora offers free deluxe sample of Chloe L'Eau de Chloe with any $25 purchase. Enter code CHLOE at checkout. While supplies last. SkincareRx offers 15% off sitewide. Enter code DADDAY15 at checkout. Valid thru Jun 17. Time to Spa offers a 5-pc Elemis gift set (a $104 value) with any $75 purchase. Gift includes Pro-Collagen Marine Cream 15ml, Pro-Collagen Quartz Lift Mask 15ml, Pro-Collagen Hand & Nail Cream 20ml, Pro-Collagen Lifting Treatment Neck & Bust 15ml and a Blue Cosmetic Bag. Enter code PROTECT at checkout. While supplies last. Time to Spa offers a 3-pc Elemis Men gift set (a $42 value) with any $30 purchase. Gift includes Deep Cleanse Facial Wash 50ml, Skin Soothe Shave Gel 30ml and SOS Survival Cream 20ml. Enter code BEAMAN at checkout. While supplies last. Trish McEvoy offers deluxe travel sizes of Gentle Cleasing Wash and Beauty Booster Serum withany purchase. No code needed. Valid thru Jun 15. Shipping is free with $50 purchase.